The leaders of China and Taiwan met on Nov. 7 in Singapore, marking the first time heads of the once-bitter rival states saw each other face-to-face after the effective conclusion of the Chinese Civil War in 1949. While no concrete agreements were reached, the meeting has raised concerns among Taiwanese political opposition members, who are wary that Ma’s meeting with Xi and similar contacts will pave the way for Beijing to assert greater control over the island and undermine its liberal democratic system. A Chinese regime spokesman expressed the desire for cross-strait relations to continue to develop “in a correct manner,” that is, toward reunification with the mainland. The Kuomintang, or Chinese Nationalist Party, currently in office in Taiwan had controlled China before and during World War II, but was forced to retreat from the mainland in 1949 following defeat by communist forces in the civil war, which broke out in 1946 following abortive peace talks between communist and Nationalist leaders Mao Zedong and Chiang Kai-shek. “Both sides should respect each other’s values and way of life,” Ma said before reporters. He lauded “peaceful and stable” relations with the mainland, which warmed considerably in the 1980s and 1990s. Xi Jinping alluded to the communist regime’s long-standing goal of bringing Taiwan back into the fold, saying, “We are one family,” and “No force can pull us apart.” The two leaders shook hands for about a minute before going behind closed doors for their talks. In a press release, Tsai said that she and her Democratic Progressive Party had hoped that Ma would represent Taiwan fairly and equally before China, and emphasize the independent voices of the Taiwanese people. 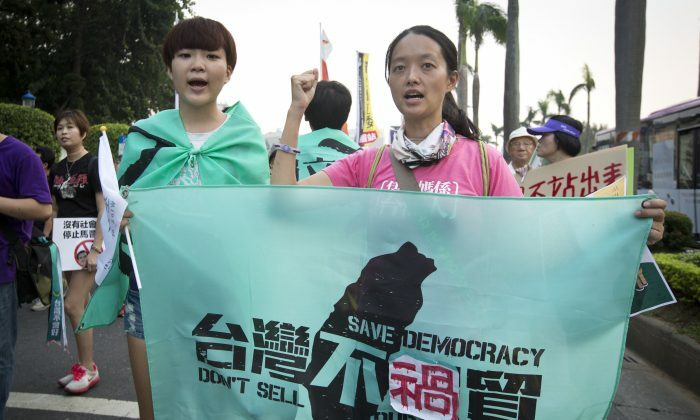 “None of them were achieved,” Tsai said. Ma, who has been president of Taiwan since 2008, is to step down from his post next May. His approval rating stands at a mere 20 percent, up from 9 percent last year. At a press conference on Nov. 5, Ma was asked about an earlier statement in which he pledged not to meet with mainland Chinese leaders. He responded by saying that he had agreed to the Nov. 7 meeting because it was to be held in Singapore rather than mainland China. In a post-meeting conference, Ma said that he had raised concerns with Xi over the Chinese regime’s continued military threats, last demonstrated in recent Chinese war games that appeared to simulate an attack on Taiwan’s presidential office. Ma also said he discussed with Xi the Taiwanese people’s desire for greater participation in global society, particularly for nongovernmental organizations. China refuses to acknowledge the island as anything other than a breakaway province, and pressure from Beijing keeps Taiwan out of the United Nations and other major multinational organizations. China Central Television (CCTV), the Communist Party-controlled state-run broadcaster, ran the meeting live, but with conspicuous censorship: the broadcast showed Xi Jinping making his statements, but when Ma spoke, the scene would cut to CCTV commentary. Ma said Xi told him that China would “appropriately handle” Taiwanese moves toward greater participation on a case-by-case basis.